Cement mortar linings are unique, in that they are porous structures. Corrosion protection is achieved by the development of a highly alkaline environment within the pores. This environment is a result of the production of calcium hydroxide during cement hydration. 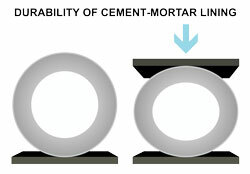 Cement mortar linings, while having substantial adhesion or bond, do not depend on bond to remain in place. 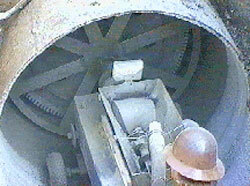 A cement lining of proper thickness acts as a compression ring within a tension ring. It is a continuous arch which, being confined by the pipe, has no place to go. Deflection in a pipe merely increases the perimeter of the cement lining with respect to the pipe wall perimeter and thereby pushes the lining tighter against the wall of the pipe and resists the forces causing the deflection. The ability of a cement-mortar lining to remain in place during deflection of the pipe was demonstrated in a test conducted on a 72" (1,828.80 mm) diameter welded steel pipe section with a 5/16" (7.94 mm) wall thickness. A 1/4" (6.35 mm) cement-mortar lining was centrifugally applied and allowed to cure properly. During the following 16-month period, the lining was thoroughly dried out and the pipe was subjected to shock and vibration tests to demonstrate the integrity of the lining. At the end of this period, various loads were placed on top of the section until eventually a load section of 13" (330.20 mm) on the vertical axis was reached. Although hairline cracks appeared during the deflection, no impairment to the lining was observed either during the test or afterward when the load was removed. The W. Walsh Company lining process complies with AWWA Standard Specification C602 (Cement mortar lining of pipelines in place). The proportions of cement and sand in the mortar for the lining should be one part by weight of cement to between one and one-and-one-half parts by weight of sand (1:1 to 1:1.5 cement/sand). It is important to keep the water:cement ratio at a minimum to produce the most durable lining. The W. Walsh Company is a certified installer of Brico Industries, Inc. Depend-O-Loc InnerSeal. The InnerSeal has the desirable low profile that assures maximum flow and low turbulence at the cement lining - joint seal interface.